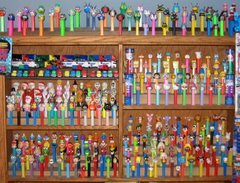 The official web site of the PEZ company has a new (brief) history of PEZ. Click on the above image to link you there. The site also includes an archive of ALL generally issued PEZ and the year they were first offered. Click on the above image to link you there. On the web page click on the window on the left "DISPENSER ARCHIVE BY YEAR". Disney PRINCESS TIANA has finally been spotted in stores (on the east coast) a full 10 months after the movie's release. The new SNOW WHITE set is just out.